Green laser with shades to block green light. Just received my, “Flashlight Sample” from Hong Kong. I guess it’s better than calling it a high power laser and losing it at customs. I’m certainly satisfied with seeing a clearly visible beam in just about any light condition! No smoke required! Using it to cut electrical tape like butter, and popping balloons never gets dull! Shining this thing on the ceiling literally lights up the whole room! The only downside is that there are warnings NOT to look at the dot without eye protection… how can I resist!? The legality of high power handheld laser pointers is somewhat murky and will likely change in the near future. It may be a federal crime to shine a powerful laser at the sky (who could resist doing this) since it may hit an aircraft. 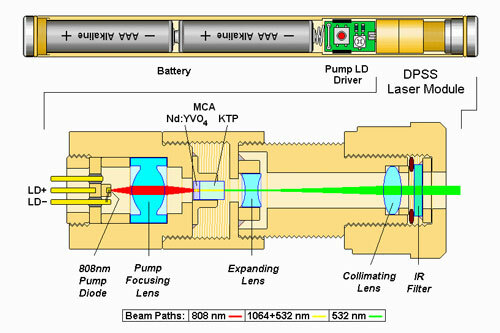 This is a Diode Pumped Solid State laser (DPSS). The actual diode inside is an infrared laser, and the light gets changed to a green color by a rather interesting, yet inefficient process. Anyway I don’t want this post to be too long, so head here if you want to learn more! 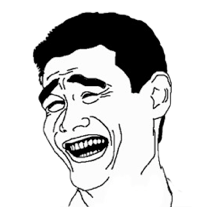 I’ve read that cheap DPSS lasers don’t have the IR filter in order to have a higher power output. This must dramatically increase danger since shades probably don’t block IR too! 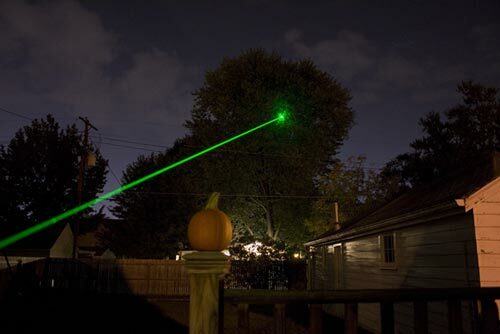 Picture of a similar laser. I plan on putting this bad boy on a robot that will drive around popping balloons, and target tank cut outs made out of black flash paper. Another possible use is to buy a simple line camera and make a laser distance sensor. Sellers include Laser Glow, Dragon Lasers, and Wicked Lasers. I would be curious to see how well some of the laser modules from deal extreme work. Maybe I’ll get this guy! After a year and some change the laser diode failed. Disappointing since I never went through a set of batteries! That’s a pretty good indication that the laser diode was being driven far beyond its ratings. Be warned when buying from Wicked Lasers! Just wondering about the Green laser DPSS, if you take out the expending lens, will you get a narrower beam, and more energy density(because of smaller illuminating area)? just to show how little I know about lenses lol. I think the expanding lens and the collimating lens work together to make the output light rays parallel. This keeps the beam from diverging. 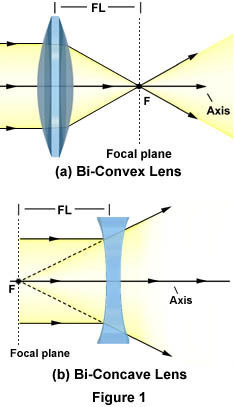 If you removed the expanding lens and moved the collimating lens closer to the crystal you could get a narrower beam, but only at its focal point. If you do some ray tracing maybe you’ll agree. I googled a few places and it sounds like dpss laser kits come with the expanding lens. so now you have the beam coming straight out of the crystal-pair. btw i would suggest either building a laser, or buying the laser module from deal extreme.